Latish evening visit. Darts match in full swing with the smell of the chicken bucket buffet prevalent. Evening visit until 11pm close. I'd rather like to see local SE London and nearby Kentish brewery beers here. Evening until close. Always good to have a look at Ronnie and Reggie too. Evening. A busy bee tonight with Terry's (the pub tenant) birthday party with a bow-tied tribute singer. Well packed but some floor space for some to dance too. Cottage - Big Ben 4.90 Not Tried Clip says "British Craft Ale"
Evening. Lot of Greene King staples on tonight! My first visit here for a while. Not a lot has changed. Some new upholstery. A little less fly-blown. A few entertaining 'characters’ at the bar. Hop Stuff - Saisonniers 4.50 Spicy, herbal, golden saison in perfect condition. Very tasty. North Yorkshire - Yorkshire Porter 4.40 A very tasty, black porter with a fruity edge and lots of roast barley. Evening until close. Honoured to be able to have a close up look at the lizards and feel the warmth on the back of one - not cold blooded at all! 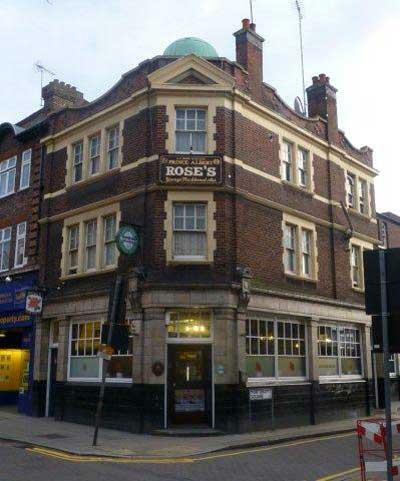 The pub is found in Woolwich, Greater London, SE18 6NE. A cracking old pub, near to the Woolwich Ferry. A long-standing GBG entry with some gaps. 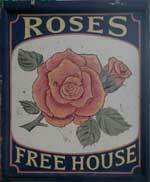 Goes by both names of Rose's Free House and the Prince Albert. Rare to see a vivarium with 2 lizards always keeping their beady eyes on proceedings. Located at the Woolwich Ferry end of Hare Street - an area in 2016 full of boarded up retail units ripe for redevelopment. The bar counter sports 6 handpumps but never all in use at one time. We have visited this pub 17 times, seen 51 different beers and tried 29 of them.